Indian Army soldiers performing Yoga, on the occasion of the 3rd International Day of Yoga – 2017, at Siachen on June 21, 2017. The Indian Army is the proud first line of defense for the world’s largest democracy and is known for its valour and bravery, even in the face of the most extreme conditions. Despite its forever engaging task of protecting the nation, the Indian Army has never shied away from participating in all national campaigns and events, that are aimed at nation building and internal stability of the country. The Indian Army leads from the front in cases of controlling domestic crisis situations like violence and also plays a critical role in disaster relief and rescue. The Indian Army has to its credit, the experience of holding ground in the highest battlefield of the world, Siachen. Located in the Eastern Karakoram ranges in the Himalayas, the Siachen glacier is a place where everything is ferried from the hinterland. It is therefore a logistics challenge to move all types of waste out of the glacier so the waste generated does not become an environmental hazard. 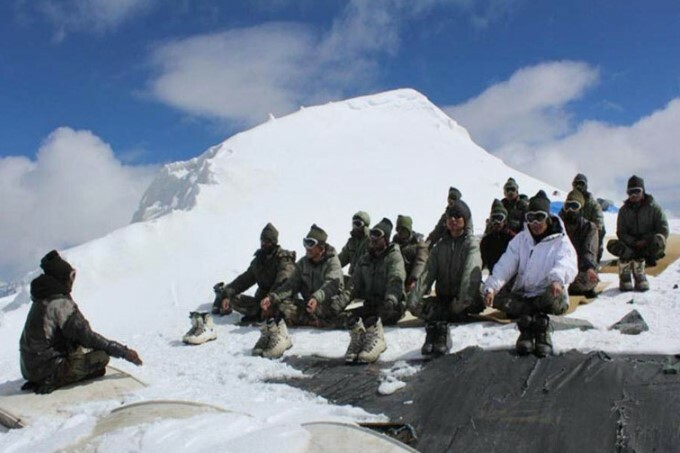 The Indian Army has therefore been very mindful of the waste challenge in Siachen and has always ensured that it does not lead to any kind of problem. Now, since October 2014, when the Prime Minister of India Narendra Modi launched the Swachch Bharat Abhiyan, the Indian Army troops positioned in Siachen have also been participating in this campaign with great enthusiasm. The troops at Siachen have removed and sent back more than 63 tons of garbage from Siachen glacier to the Base camp. The waste material being removed includes packaging material, barrels and other perishables. From the base camp, the waste is sent to disposal areas, where it is buried in deep trenches which are mechanically dug in areas which are not on run of the rivers and where landmass is not fragile. A major chunk of this waste has been brought back through man-pack loads, porters, ponies and sometimes returning helicopter ferries. Mahatma Gandhi had once noted that Sanitation is even more important than independence. The Indian Army has not forgotten these thoughts of the Father of our Nation as it continues to take steps to ensure safe disposal of waste and hygiene, even in the highest battlefield of the world.